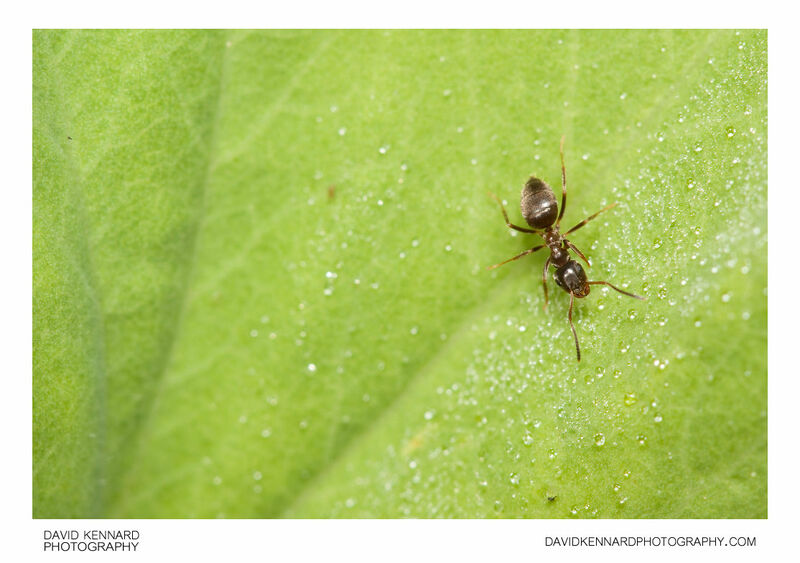 A black garden ant (Lasius niger) explores on a leaf of Lady's Mantle (Alchemilla mollis). Alchemilla mollis, Lady's Mantle, is an herbaceous perennial plant native to southern Europe and grown throughout the world as an ornamental garden plant. It grows 30 to 45 cm (12 to 18 in) tall, with leaves that are palmately veined, with a scalloped and serrated margin. The chartreuse flowers are held in dense clusters above the foliage. According to some accounts, Lady's Mantle has been used for centuries as a herbal remedy. According to other authorities it has never been used medicinally, but has been confused with two species that have a history of medicinal use: A. alpina (Alpine lady's mantle) and A. xanthoclora. The plant is often grown as a ground cover, and is especially valued for the leaves in wet weather, as the water beads and sparkles on the leaves. This is due to the remarkable dewetting properties of the leaves, whereby the contact force between the water and the leaf is so disfavoured that a thin layer of air penetrates the solid-liquid interface. These beads of water were considered by alchemists to be the purest form of water. They utilised this water in their quest to turn base metal into gold. Hence the name "Alchemilla". The black garden ant (Lasius niger) is a formicine ant, the type species of the subgenus Lasius, found all over Europe and in some parts of North America and Asia. It is monogynous, meaning colonies have a single queen. Lasius niger colonies can reach in size up to around 15,000 workers but 4,000–7,000 is around average. A Lasius niger queen can live for around 12 years. This type of ant is a problem for some gardeners. They will farm aphids for the honeydew they excrete by bringing them inside the nest and bringing them back out again when necessary. The ants will also eat ripe fruits, especially fruits like strawberries that lack a thick protective skin. Often they can be found on discarded chewing gum. Lasius niger also feed on insects and spiders, and other small invertebrates. In Ireland they are usually referred to as pismires, an archaic term for an ant.